Trailer Park: The Bourne Legacy! Anyone can tell you if a trailer "looks good" or not. But Drew Magary, who spent over a decade working in advertising, is here to tell you whether or not a trailer WORKS. This week's trailer? "The Bourne Legacy". Now here's a movie with a great deal at stake. After Matt Damon and director Paul Greengrass decided to not do a fourth Jason Bourne film, the folks at Universal (our corporate cousins) decided to keep the franchise going anyway. 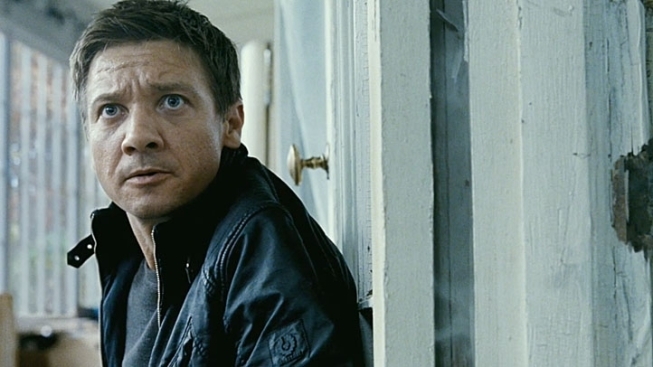 But instead of trying to find a new Jason Bourne, they wisely sidestepped that little landmine and hired Jeremy Renner (who is awesome) to headline the franchise as a new character. So this is a "Bourne" movie, only without Jason Bourne. Got that? Confusing, I know. Just know that there will be lots of kicking and punching and shaky camerawork. As for that camerawork, the man replacing Greengrass will be Tony Gilroy, who directed "Duplicity" and "Michael Clayton" and was the screenwriter for the previous two "Bourne" movies. This gets a little juicy, because Damon was quoted in GQ last month saying that Gilroy's original script for "The Bourne Ultimatum" was a horrible "career-ender." It takes a lot to get someone as famously composed as Damon to light you up in the press, so this will be Gilroy's stab at salvaging his reputation. Will this newfangled "Bourne"--featuring a new guy going through the same hyper-realistic international intrigue--keep America's attention? Let's watch the brand spanking new trailer and answer a few questions. Does the trailer let us know what the movie's about? Well, that's just the thing. When the title of your movie is "The Bourne Legacy," you can pretty much already deduce the plot: a rogue agent who was trained to be a super badass goes out and exacts revenge on the shady government folks who would use him to conduct evildoing. There's enough in this trailer to give you the gist: Renner plays a man named Kenneth who is welcomed to "the program" by Albert Finney, who is clearly filling the Brian Cox role of "evil old dude." Then you have people explaining that Jason Bourne was merely the first in a long line of superagents and that Renner is also one of them. In fact, stats show he has even GREATER capacity for OWNAGE than Bourne, which I think is overselling it a bit. But there you have it. Does Renner beat up people real good? Awwwww yeah. You see glimpses of him taking out some poor guards (guards always end up dead), and a shot of him hauling through the snow in order to do a little bit of snipin'. Whoa, was that a fire extinguisher gun? It was! Hopefully, it'll be like the fire extinguisher gun in "Salt," only not stupid.
. You see him committing to the program and then being injected with all kinds of superawesome government powerups. He may very well be an X-Man. Did Edward Norton probably demand to write all his own dialogue? You know he did. What's with all the sliding bars? I dunno. Some fancypants graphics guy probably thought it would be cool to only see Renner through virtual venetian blinds. Lucky for him, Renner is cool enough to make it work. Does this trailer work? YES. Very much yes. There are enough cues here - from the ominous music, to Joan Allen's return, to people saying the name "Treadstone" in hushed voices, to Renner taking out hapless bad guys - to let you know that Universal plans on picking up right where the franchise left off. Who knows? Maybe they'll even improve it. All they'd have to do is get rid of the Moby song at the end.